* Photo: Mother Hubbard Custom Cabinetry, Central Pennsylvania. 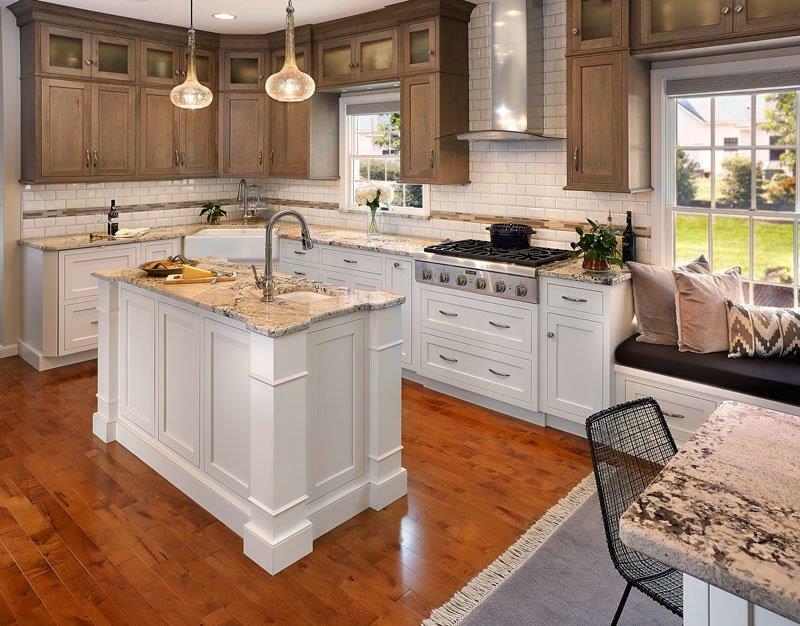 Have you been desiring a new kitchen? One that is sleek, defined, and elegant. Add instant glam and class to your kitchen with these tips for creating a luxurious kitchen. Bold Backsplash: Backsplash can add definition and depth to your kitchen’s walls, but have you ever considered only using backsplash in one specific area? You can draw eyes by targeting an area of your kitchen with a bold, classy backsplash. For example, only use backsplash above your stovetop. But when you only use it in one area, consider going all out on the project. Use a backsplash that will draw the eyes to that dramatic focal area of the room. Hidden Power Outlets: Hiding your power outlets can instantly add luxury to your space without screaming “fancy” in your face. Power outlets are a known eyesore; therefore, hiding them under cabinets, inside drawers or along hidden panels can bring your kitchen to the next level. Pantry Makeover: Invest in a full-fledged pantry makeover and you will not regret it. Create a pantry layout that provides more space and access to all your goods. Crown Molding: This can make a huge difference in defining your kitchen’s cabinetry. You can add crown molding to the space between the cabinets and the ceiling or the bottom of your cabinets and the flooring. This creates a sleek, finished look that is stunning in all kitchens. Underneath Cabinetry Lighting: This subtle feature can help homeowners as they read recipes or chop up dinner. The lighting adds to the room’s overall ambiance and creates a new sense of warmth in your space. The lights can be controlled by separate switches; therefore, they can be turned on or off whenever you please. Touch-Sensitive Sink Faucet: Have you ever been preparing dinner and have germs from meat all over your hands? Instead of potentially spreading germs by touching the faucet’s handle, touch-sensitive faucets allow homeowners to cook with ease. You can simply tap the sink’s faucet with any part of your body and the water will turn on or off. This invention is not only sleek but functional. Dramatic Flooring: The flooring used in a kitchen can set the tone of the room. If you are looking for elegance, a recent trend is the herringbone tile pattern. Brick (rectangular shape) tile are arranged in a herringbone pattern. You can make the kitchen even more luxurious by matching the backsplash in small mosaics. If you are in the market for new flooring or backsplash, we would love to help you finish off your kitchen. Visit us at Conestoga Tile for more information and pricing.